Platform convergence in journalism is beginning to make sector comparisons obsolete. Further, some companies are difficult to fit in a box: Is Atlantic Media Company a magazine, or a digital brand? Is Vice a web or television juggernaut? But it is still helpful to evaluate the revenue breakdown within media sectors because that is how most accounting is still done and, for most, the legacy product still defines the business model. In 2012, the Newspaper Association of America reported total sector revenues of $38.6 billion for the roughly 1,400 U.S. dailies—a figure that includes print and digital advertising as well as circulation and other ancillary revenues. No other single sector of the American media approaches even $10 billion in annual news-related revenues, leaving the sector, however troubled, as the clear revenue leader. About two-thirds of that revenue—$25.2 billion—comes from advertising, if direct marketing services are included. A quarter ($10.4 billion) comes from print and digital circulation. The remaining newspaper revenue is generated from a variety of sources, including events, commercial printing, e-commerce and others. The major broadcast networks’ news programming—that of NBC, CBS and ABC—along with that of PBS’ NewsHour—generated an estimated $2.1 billion in total revenues in 2012. Those revenues derived primarily from advertising on the networks’ morning and evening news programs, although, as with local affiliates, a small portion comes from retransmission fees and digital advertising. Commercial news outlets native to the web, including those where original news is just one element of their digital offerings such as BuzzFeed, still amount to a small fraction of the revenue generated by legacy news platforms. One estimate (Kantar Media) suggests this category of news generated $2 billion in 2012, although that includes web properties outside of this analysis such as guides and computer sites. A tally of publicly available estimates of specific for-profit news revenues, from large to small, comes closer to $500 million, with the vast majority of that derived from display advertising (smaller revenue streams include event-hosting and subscriptions). About $300 million was identified in the form of venture capital and owner investment. Thus, the total amount in publicly available annual revenue and investment estimates for the for-profit digital news sector comes to about $800 million. To indicate that this represents a minimum, this report suggests a range of $800 million to $1.2 billion. 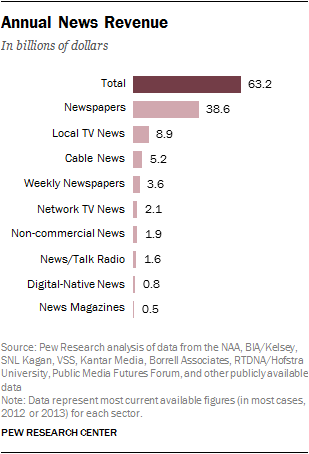 The noncommercial news sector, while small, is strikingly revenue-diverse. Combined annual revenue from NPR and roughly 1,000 local public radio stations around the country, along with scores of digital nonprofit news outlets and one of the oldest nonprofit news organizations, the Associated Press, amounts to roughly $1.9 billion.21 Large portions of that come from syndication and content-sharing arrangements, individual giving, ads/sponsorships, and philanthropy. Another element to consider is the total number of outlets within a sector and how the revenue spreads out among them in terms of reporting power. While the newspaper sector provides the most revenue over all, it is spread across roughly 1,400 daily papers around the country, amounting to an average of $28 million in annual revenue per paper. Likewise, the local TV news revenue figures represent those generated by about 800 news-producing local TV stations—an average of $11 million in news-related revenue per station. The available financial data for digital news suggests that the sector is dominated by a handful of sites, with a long tail of outlets scooping up nickels and pennies in advertising rates. The Huffington Post, for example, a digital pioneer built largely on outside contributors and aggregation, was forecast by CitiGroup Research to generate $100 million in 2013; The Blaze, which is run by conservative talk show host and media entrepreneur Glenn Beck, generates $35 million to $45 million in revenue per year, according to Fortune. And BuzzFeed, which has made a science out of viral content and is now expanding its long-form journalism, was estimated to generate $60 million in advertising revenue in 2013. But just six out of 44 for-profit independent hyperlocal news websites surveyed by community news expert Michele McLellan in 2012 managed to generate more than $250,000 each. Cable news channels and the major network news divisions, on the other hand, emerge as heavily concentrated revenue drivers for the news business. 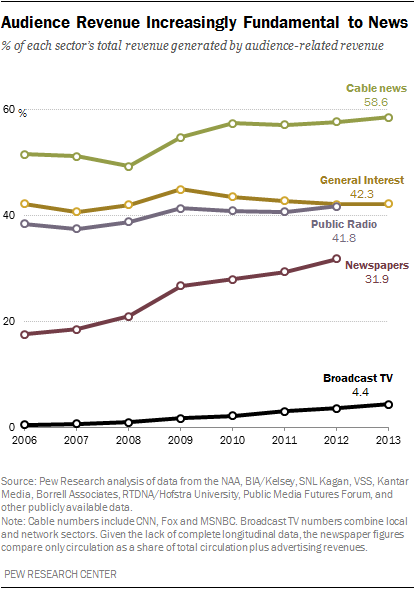 For cable, that amounts to $485 million, on average, per news channel in annual revenue. 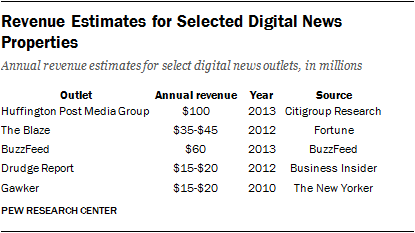 The three major broadcast news divisions produce an average of $691 million.